The synthetic turf industry is in a continuous growth curve which has no end in sight. With recent coverage in the Wall Street Journal, Discovery Channel, Home & Garden, TV, etc., the synthetic putting green industry is emerging as the media favorite and receiving incredible press coverage. This exposure and consumer awareness will generate consumer interest, demand, and a lucrative market. Our Dealers Have Instant Credibility - Name recognition. Consumers are apprehensive about buying from someone who is not established. or fill in the Distributor Questionnaire. Download the Dealer Info Package here and contact to get started. Two years before I retired from a 34-year career in education, my nephew, a landscape architect, designed a new backyard for me. It was beautiful and included a putting green as a centrally important part of the aesthetic. I loved the idea and contacted Jerome, whom my nephew recommended to supply the turf. What a stroke of luck. 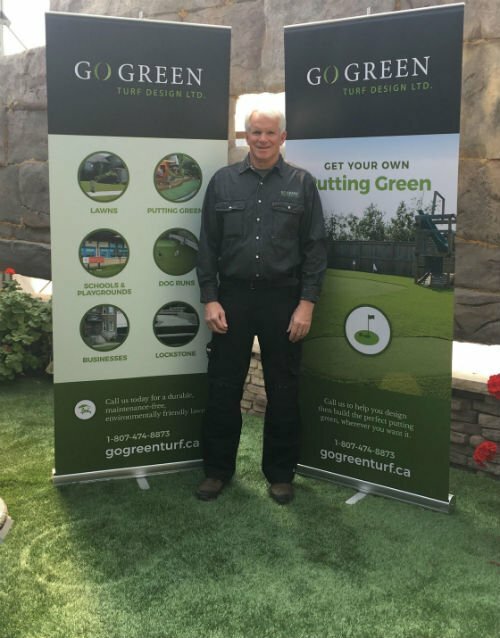 ProGreen Canada, with Jerome, Rob, and Brandi, has provided guidance, expertise, and support to begin and grow our business. 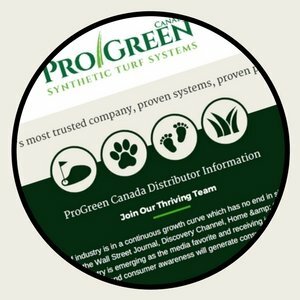 ProGreen Canada has provided the best turf product which has stood the test of time in schools, playgrounds, commercial establishments, and homes. When asked why I do this always say, “I get to stay outside in the great summer weather, customers thank me for doing the project, they say its beautiful (I've even had customers shed tears of joy), I can be very proud of it, and then they pay me. In this our 12th year of business, the customer base keeps expanding and the sales come much easier. If you like to work outdoors, and you like to provide beauty and more leisure time to your customers, this is a great business to be in. Together, We'll Both Be More Profitable!